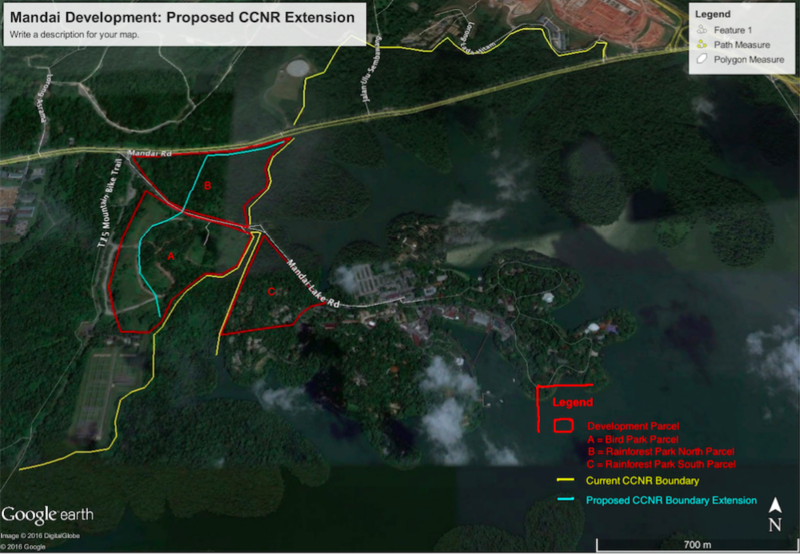 Nature Society (Singapore) has been concerned since the mid-2000s with various proposed developments at sites on either side of Mandai Lake Road adjacent to the Central Catchment Nature Reserves. The most recent proposals were those of Mandai Park Holdings (MPH) a subsidiary of Temasek Holdings, and now the parent company of Wildlife Reserves Singapore, which in turn is the parent of Singapore Zoo, the WRS Conservation Fund, the Night Safari, the River Safari and Jurong Bird Park. Earlier this year MPH released the report of the Environmental Impact Assessment (EIA) of their proposals. NSS reviewed the EIA Report and prepared a position paper in response, completed on September 2, 2016. However, NSS decided not to release the position paper immediately. NSS have collaborations with Wildlife Reserves Singapore Conservation Fund on certain conservation issues, both NSS and Singapore Zoo are members of the International Union for the Conservation of Nature (IUCN), and some of NSS members met in the early stages with the EIA team engaged by MPH to ensure that the team had the fullest possible appreciation of the biodiversity in the area. We therefore acceded to a request by MPH to forward our position paper to them before public release. NSS representatives subsequently met with MPH senior staff and consultants on two occasions for robust but cordial discussions. NSS is now releasing simultaneously its position paper, unchanged, and the MPH response. We maintain our strong disagreement with the proposed developments and regret the habitat and biodiversity loss that the developments will entail. Nonetheless in our commitment to biodiversity in Singapore we will continue to engage with MPH so as to help ensure that such losses from the developments are less than they might otherwise be. 1. Read NSS's Position Paper on Mandai Safari Park Holdings' Mandai Development Plan here. 2. Read Mandai Park Holdings Pte. Ltd. Response to NSS's Position Paper here. Registration for 34th Singapore Bird Race is Now Open!